Matthew and I enjoyed hiking a lot this summer and one of our favorite places became Silver Falls State Park near Silverton, Oregon. It’s an amazing hike that is long enough that you feel like you have accomplished something, but not so long that your legs twitch on the car ride home – about seven or eight miles depending on route. 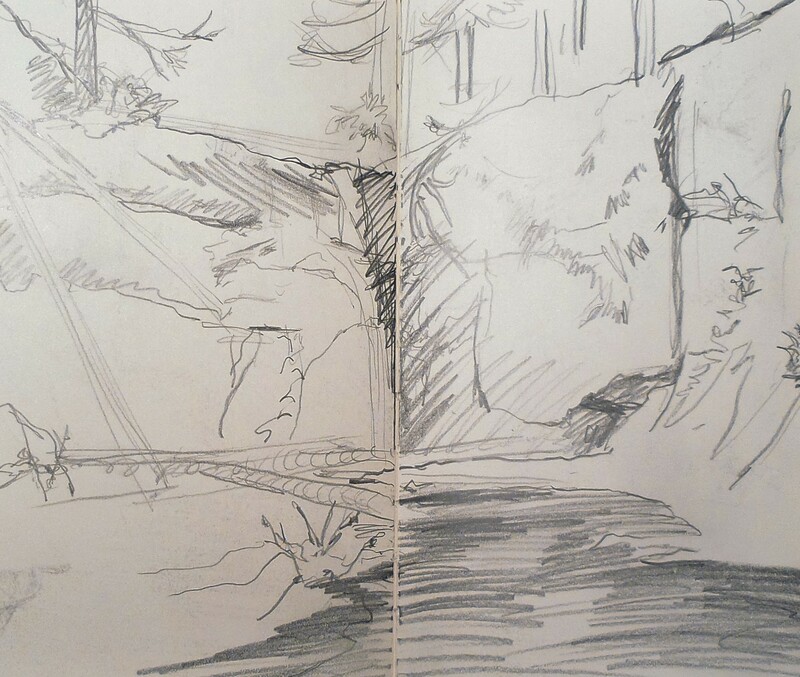 We stopped at this view of a waterfall, walked down along the rocks and sat down in the middle of the stream where the rock floor of the stream rose out of the water in a plateau to do some quick sketches. After twenty minutes, we started packing up our sketchbooks again when a smiling woman with a group of five children of various ages approached us. I obligingly opened my pack back up and said, “Yes, of course,” even though I wanted to run away. I couldn’t say no, and as a former art teacher, I especially couldn’t say no. This sketch isn’t a polished drawing by any means, it’s just a scribble of visual notes. I showed them and explained this exact idea – that I was only taking notes of what I was seeing very fast…just for me. Then I quickly turned the attention to them, “So you are interested in art?” I smiled to the kids, and I should’ve known better – they were more shy than I was. Their contorted faces, that were trying to understand what the mess was in graphite was, changed into politely smiling ones. I soothed myself with this. It is true. I just wish more of the masters and contemporary heavy-hitters would show their developing sketches more – show us the dirt instead of having to X-ray their paintings after they are dead to find out that they had once got it wrong, or that the idea changed completely. It’s hard to show how bad it can be to a group of strangers expecting a masterpiece, but it needs to be done more often so that young eyes can learn that everybody that ever plans to master anything is in a continual state of practice, and practice, no matter how many hours put in, can still be a mess.